Today means different things for Australians around the country. Whether you’re reflecting, protesting or celebrating, what shapes and binds us as a nation is our love for our nature. Our land is like no other, so today we’re honouring its wild and wonderful ways. Through Google Street View, we’ve been mapping natural landmarks around Australia – from Queensland’s Great Barrier Reef to Victoria’s Twelve Apostles Marine National Park. Today’s Doodle takes us to Western Australia to celebrate the magnificent Fitzgerald River National Park of which the Southern Noongar and Wagyl Kaip people are the Traditional Custodians. The park offers diverse terrains – rolling plains, colourful breakaways, rugged peaks, headlands, stunning bays and inlets. With guidance from Department of Biodiversity, Conservation and Attractions, today’s Doodle celebrates this unique landscape, as well as the flora and fauna of this spectacular spot. 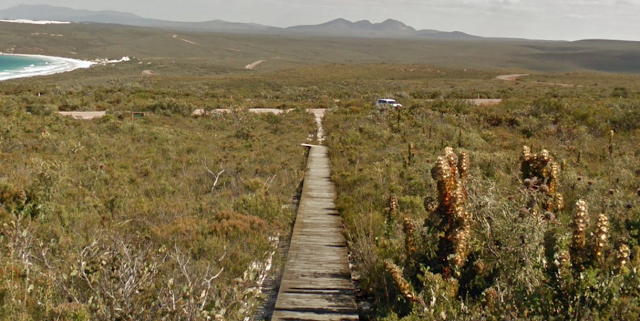 Fitzgerald River National Park is one of the largest and most botanically significant national parks in Australia. More than 1,800 plant species grow in the park — 75 of these, including the iconic Royal Hakea, cannot be found anywhere else in the world. The park is also home to more than 200 bird species, 41 reptile species, 12 frog species, and 22 mammal species, including the honey possum featured in today’s Doodle. These mouse-sized marsupials, also known as “Noolbenger”, have tails that are longer than their bodies, pointed snouts, and long tongues covered with bristles to help them drink nectar from native flowers like the Banksia (also featured in the Doodle). Tiny but thirsty, the honey possum can drink the equivalent of its body weight in nectar per day! They also help the plants reproduce by spreading pollen as they feast. In the background, the Doodle depicts a grand vista of rock formations and the Barrens coastal range, which is perched on the edge of the Southern Ocean. The range is characterised by uplifted and tilted grey quartzite rocks (once sediments on an ancient sea floor) and magnificent multicoloured cliffs of spongolite. However you spend today, we invite you to explore the trails and jagged coastline of Fitzgerald River National Park. Start your adventure by heading down the Hakea Trail to enjoy the spectacular views at Quoin Head.